It was 1997. He was languishing in Bradford City reserves in the (then) English First Division. A short loan spell at Gillingham had come to nothing. He was told he could leave for free if he could find another club. Rotherham turned him down. Scunthorpe turned him down. It looked as though his goalkeeping career – the highlight of which had been a Wembley play-off final for Bradford just the year before which took them up to Division One – was coming to an inauspicious end. With one phone call Jonathan Gould’s career and life turned upside down. A Scottish agent tipped him that Celtic – Celtic! – might be looking for a back-up keeper and his name had cropped up. Thinking it was too good to be true, he phoned his Dad (former Wales Manager Bobby) who phoned his pal Craig Brown to speak to his brother Jock Brown (Celtic’s General Manager at the time) who passed word back that Celtic were indeed interested. But he had to get to Celtic Park for 5pm that day to meet a European signing deadline – otherwise he could forget it. After picking Bradford City manager Chris Kamara up off the floor, Gould drove his Fiat Punto at full pelt up the M6 to sign on the dotted line. 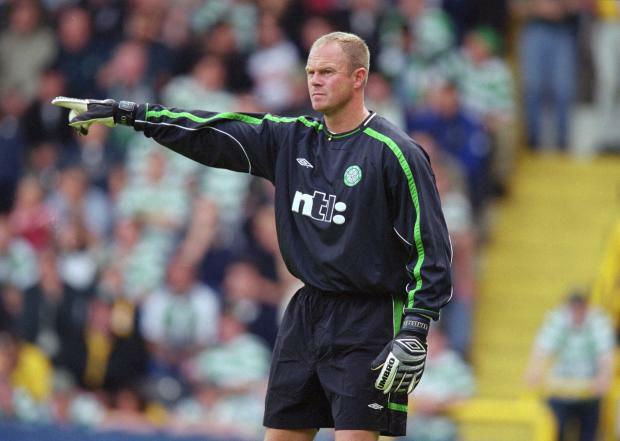 Over the next six seasons he notched up 158 first team appearances, won two League Titles and two League Cups, helped Wim the Tim stop the Ten and did his bit behind Rab Douglas as Martin O’Neill led Celtic to a glorious Treble in 2000-2001. He may have been signed as third choice to Gordon Marshall and Stuart Kerr but Gould didn’t just seize the opportunity, he swallowed it whole. He was to prove one of the most popular and engaging Celts of that era. The break-neck speed of events that took him from Rotherham reject to Celtic’s No.1 goalkeeper proved too much for one pal when Gould rang him from Glasgow later that day to break the good news that he’d signed for Celtic. It was some time before the pal would believe that Gould would be playing European football with Glasgow Celtic and not non-league football in the English Conference with the Stalybridge version. To be fair no-one could have predicted the extent to which his goal-keeping fortunes would change for the better. But Jonathan Gould has the medals to prove it.